Chinese New Year blockbuster "No Thief", which insiders predict will be a box office hit, premiered in Beijing last night, making 100,000 Yuan on its opening night. Though the film opened at twelve o'clock, moviegoers still flocked to cinemas eager to be among the first to see this long-awaited film, China Radio International reported Friday. Cinema's screening the film report that about 80 per cent of the seats were occupied, with predictions that ticket sales will climb later this month. 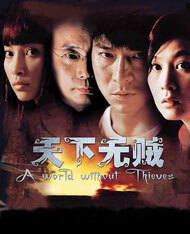 "No Thief " stars Hong Kong actor Andy Lau and Taiwan actress Rene Liu.